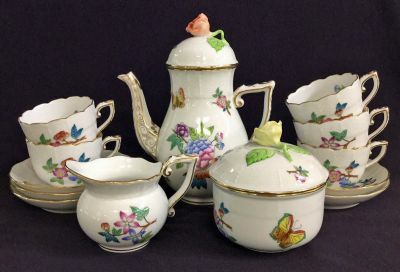 Vintage Herend “Queen Victoria” coffee Set. This is a multi-motif pattern with many variations on floral sprays and butterflies. Coffee pot, creamer, covered sugar bowl, 5 cups & saucers. The pot is 7” high. The cups are 2 1/2” high. The saucers are 4 1/2” in diameter.